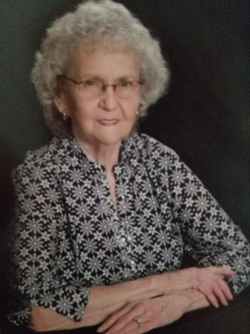 Mary Sue Bolling, 88, of Lawson, Mo., passed away September 24, 2017 in Hannibal, Mo. Mary was born June 13, 1929 in Lee’s Summit, Mo., to Claude and Lucy (Nowlin) Myres. On October 13, 1947 she married William R. Bolling in Post Oak, Mo. Mary worked at Lake City Ammunitions Plant, Jackson County Hospital, and for Ray County Elections. She also cooked for Inspiration Point Church Camp for over 18 years. Mary was a former member of Fairmount Christian Church, was active as a 4-H Leader, and was a member of Ray County Extension Club. She was also a member of Old Union Christian Church for over 55 years. Mary is survived by sons, William Edward Bolling, Kevin Duane and Kathleen Bolling; 10 grandchildren; 28 great grandchildren; as well as siblings, Dorothy Gatewood, Carol Osterberger, and Bob and Joan Myres. Mary was loved by all and will be missed. Visitation will be from 6 to 7:30 p.m. Thursday, September 28, 2017 at Old Union Christian Church in Lawson. Funeral service will be 11 a.m. Friday September 29, 2017 at the church. Burial will follow at Old Union Cemetery. The family requests donations be made to Old Union Christian Church. Arrangements are through Bross & Spidle Funeral Home – Lawson Chapel, Lawson, Mo. Sue was such a nice person. I am glad I had the chance to know her.